PARIS -- "We're No. 1!" That refrain is relentlessly sounding out now through much of the United States, as bowl-bound college football teams (all 50 of them, no less) ready for holiday-season tussles. Things are a bit awry, however, in Bowlsville. The once vaunted BCS, designed to determine a decisive No. 1, has seen the "C" rudely ripped from its pretty little acronym. This year it's the WCS - Worst-Case Scenario - with common sense slaughtered at the altar of the statistical crunch. Fifteen-year-old females outperformed males in reading in every country in the OECD/PISA study. All that means, of course, is that this year we'll have even more chowderheads blabbering into TV cameras, "We're No. 1!" At least some final rankings, however, are already in, when it comes to academic performance - a vital consideration in may site selection decisions. And these rankings, at least, promise more believability than the WCS BCS. And on the global playing field, the "We're No. 1" honors go to Finland, Japan and Korea - places where the football spurring deep passions is round, not oblong. Finland, Japan and Korea were the top finishers in an OECD (www.oecd.org) study that measured 265,000 15-year-olds' literacy in reading, mathematics and science (see charts accompanying this feature). U.S. fans fed up with the BCS may find little comfort in the OECD rankings. The apropos U.S. refrain would run something like, "We're No. . . . Ah, 'Bout Average, Dude, . . . Whatever." U.S. students finished 15th in reading, 19th in math and 14th in science - and in a study that only ranked 31 nations. U.S. education officials were less than thrilled with that showing in the study released last week by Paris-based OECD, an intergovernmental organization of industrialized countries for cooperation in research and policy development on social and economic issues. "We see on the reading assessment that we have more kids scoring at the highest level than many participating countries," said U.S. Secretary of Education Rod Paige. "But we also see that we have more kids at the lowest level than some of the countries." 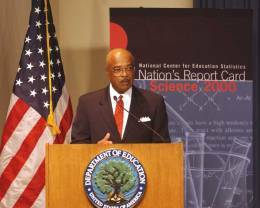 "Unfortunately, we are average across the board compared to other industrialized nations," said U.S. Secretary of Education Rod Paige. "In the global economy, these countries are our competitors. Average is not good enough for American kids. "We see on the reading assessment that we have more kids scoring at the highest level than many participating countries," Paige continued. "But we also see that we have more kids at the lowest level than some of the countries." Despite U.S. students' middling showing, government officials praised the study - long-windedly titled Outcomes of Learning: Results from the 2000 Program for International Student Assessment of 15-Year-Olds in Reading, Mathematics, and Science Literacy. The study was conducted by the OECD's Program for International Student Assessment (PISA). It marks the first round of PISA's global educational assessments, with further studies scheduled every three years. Other global educational leaders worldwide have likewise warmed to the study's approach. It eschews the often-derided model of curriculum testing. Instead, it accesses whether students nearing the end of compulsory education have the knowledge and skills needed for full participation in society. The OECD/PISA study's focus on skills for living, rather than curriculum testing, has drawn support from many global educational leaders. "What makes PISA unique is its broad focus on literacy, rather than specific curricular knowledge," said Gary Phillips, acting commissioner of the U.S. Education Dept. 's National Center for Education Statistics (nces.ed.gov), which directs the OECD study in the United States. Phillips also lauded the program for testing students at a meaningful age. "PISA's focus on age 15 allows countries to measure outcomes of learning that reflect both societal and education system influences, and measure students' preparedness for adult life beyond compulsory schooling." Added Paige, "PISA . . . gives us the opportunity to learn from those countries that are performing better than we are. And because PISA measures students' learning that has occurred in school and out of school, it shows us why we need to engage every community in setting high standards for schools and improving the life experiences of every child." Across-the-board quality characterized the study's top-scoring nations. No. 1 performers Finland, Japan and Korea, for example, were also among the countries with the narrowest gap between the highest and lowest performers. Korea was the nation with the smallest variation, indicating that all its schools were doing well in educating their students. The study, however, didn't pretend to have easy answers to why some nations' students performed better. "Successful performance is attributable to a constellation of factors," OECD Deputy Director for Education Barry McGaw said at a press briefing. One factor the study did find: Students tended to do worse in nations in which there was a high degree of segregation along socioeconomic lines. In the United States, the study found a bigger difference among students from different schools and socioeconomic groups than in most other countries. Yet those same differences didn't affect some other nations' performances. "In Finland everyone does well and social background has little impact," said Andreas Schleicher, deputy head of the Statistics and Indicators Division of OECD's Directorate for Education, Employment, Labor and Social Affairs. Iceland, Japan, Korea and Sweden also displayed above-average levels of reading literacy and a below-average impact of social background on student performance. In contrast, the Czech Republic, Germany, Hungary and Luxembourg recorded below-average reading literacy and above-average impact of social background, the study found. U.S. scores also registered performance gaps along racial and ethnic lines. PISA's study found that white and "other" 15-year-olds (including Asians, American Indians/Alaska Natives, Native Hawaiians or Pacific Islanders, and multiracial students) outperformed Black and Hispanic students in reading, mathematics and science literacy. PISA's first-round study was most intensely focused on reading, officials explained. On the positive side, an average of 10 percent of 15-year-olds in the world's most developed countries have top-level reading literacy skills - that is, they are "able to understand complex texts, evaluate information and build hypotheses, and draw on specialized knowledge." Australia, Canada, Finland, New Zealand and the UK scored highest in top-level readers, with between 15 percent and 19 percent of their students registering in that range. In contrast, however, an average of 6 percent of 15-year-olds scored below Level 1, PISA's lowest level of reading proficiency. Another 12 percent only scored at Level 1, which requires students to complete very basic reading tasks like locating a simple piece of information or identifying a text's main theme. "Young people in these categories show serious gaps in the foundation of literacy skills needed for further learning, impairing their ability to benefit from further educational opportunities at school or beyond," the study summary noted. In terms of gender, 15-year-old females outperformed males in reading in every country. In mathematics or science, however, there were no significant differences between the sexes. "Significant differences between countries reflect the varying abilities of countries to provide a learning environment or broader context that benefits both genders equally," the study noted. "In all participating countries, males are more likely than females to be at Level 1 or below in reading - in the case of Finland, the best performing country, over three times as likely." The study also measured students' "general engagement with school," which accounted for "big variations in attitudes to reading and even more so to mathematics." More than one in four students in 20 of the 28 OECD member countries surveyed "consider school a place where they do not want to go." With 46 percent, Belgium had the highest proportion of reluctant students, followed by Canada (37 percent), France (37 percent), Hungary (38 percent), Italy (38 percent) and the United States (35 percent). Even students' attitudes, though, weren't an automatic performance determinant. "The relationship between student attitudes and results is complex, and some countries perform well despite below-average attitudes," the study noted. "There is no single factor that explains why some schools or countries have better results, but there are some school policies and practices that tend to be associated with success," the study added. "For example, the extent to which students use school resources, to which specialist teachers are available, and to which schools have a role in decision-making tend to have a positive impact. Performance also tends to be better where teachers have high expectations and morale, and where classroom relations and discipline are good." Who's No. 1 in U.S. Schools? Coincidentally, perhaps another element of educational quality surfaced in another recent survey from Public Agenda (www.publicagenda.org). That survey asked U.S. school leaders, "Do you have enough freedom and autonomy to remove ineffective teachers from the classrooms?" Only 28 percent of the 853 surveyed public school superintendents said that they "have enough" autonomy to get rid of bad teachers. Of 909 participating principals, only 32 percent said that they had enough clout to dismiss bad teachers. Put another way, in the Public Agenda survey, the folks supposedly steering the ship weren't No. 1. Source for all charts: OECD/PISA. Outcomes of Learning: Results from the 2000 Program for International Student Assessment of 15-Year-Olds in Reading, Mathematics, and Science Literacy. The study is available through OECD for US$19. sf1210bsf1210b ©2001 Conway Data, Inc. All rights reserved. Data is from many sources and is not warranted to be accurate or current.